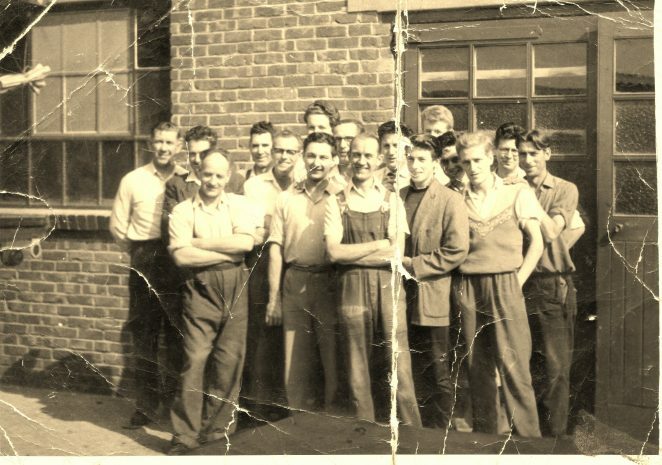 A photo c.1961 of the Frame Shop workforce of Jenners/Southern Frames Furniture Factory, Newtown Road, Hove which stood opposite the South Stand of the old Goldstone Ground. This was demolished some years ago and new factory units built. The personnel are as follows left to right. Fred Duplock, Arthur Hall, Bert Poole, Lloyd Fox, Jack Steer, Mike Cattle, (behind Mike) Ian Witchall, Mac., UK, Brian Birch, Malcolm Tester, Ron Birch, (behind Malc & Ron) Ted Pearce, UK., Reg White, Timber Delivery Driver. My dad, Lloyd Fox, is in this photo. He worked for Jenners for some years late 40’s to 1964 when he and my mum returned to Canada. He was a wood machinest. I used to meet my dad from work some evenings with my mum when they were based in New England Road and I remember some times during school holidays we would meet him for a picnic lunch in Hove Park at lunch time. Happy Days. My mother, Rene (Irene) Searle worked for Jenners as a machinist making the furniture covers from around 1953 onwards. Does anyone remember her? Malcolm Tester-middle front right “my old man”, he worked there until he did his National Service. I worked at Jenners on two occasions in the early sixties. One time was working on making up the wings for the suites and another time as a finisher working next to my Dad Jack (who is in the photo, the one with the glasses next to Bert the bald man). I also recognise Brian Birch and I think that is Ron peeping out next to him. I also recognise “Mac” standing between my Dad and Brian. I went to school with Malcolm Tester as well as working with him at Jenners. There are a lot of faces not in the photo Harold Fensom, Arther Hall (and me of course) I went into the Merchant Navy from there. Forgot to mention, person on the right in the front is Bob Nicholson (my brother in law) who worked on the sanding machine. He sadly died of MS.
Our dad, Reg White worked at Jenners from the late 40’s until 1975. His brother Jim worked in the upholster’s shop, dad also worked with Derek Leary who married Dot a Machinist. Dad is pictured 2nd right on the back row. Hello Dave Steer. It’s good to see your comments about Jenners. The photo was taken by John Rubidge who was a keen photographer. Obviously not everyone wanted to be in the photo. Arthur Hall is there second from right. I thought he was your brother in law. You’re right about Ron peeping out next to me. We had a lot of fun at Jenners and I lasted 10 years, 1959-1969. Please get in touch, my email address is brian.birch2@ntlworld.com. My dad worked at Jenners in the ’50s and ’60s. He was an upholsterer, Bill Newman. I remember him talking about Ron Birch, Johnny Antrim, Dennis? Homan. Anyone remember them? I worked at Jenners from 1964 to 1966. I was a trainee upholsterer so I don’t remember many in the frame shop. The two that stand out are Ian Horne and Mac. The upholsterers I remember are Jim Gunn, Roger Baines and John Ray. I remember Vi in the canteen and her daughter. I used to do the lining up for the upholsterers with Ian Randall.